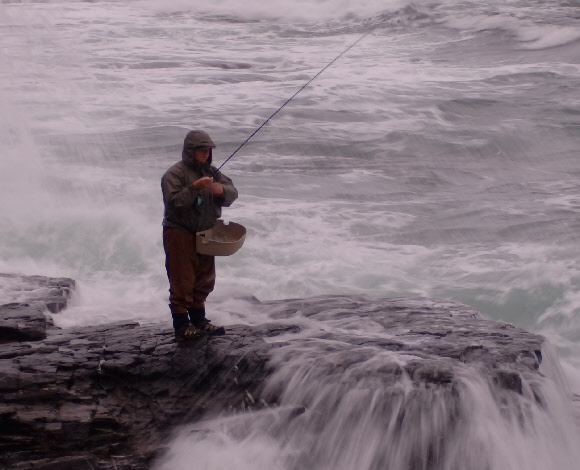 Saltwater fly fishing the British coastline is growing in popularity every year .For many of us the learning curve takes us away from pre stocked man made fisheries and outwards in search wild fish and sometimes wild places. There's no doubt that the tackle manufacturers regard your new found quest as a potential bounty. Given a few sessions or seasons you may be in the market for a new saltwater resistant set up but don't go crazy straight away. Personal safety and breathable lightweight apparel should go higher on the list than the latest rods and reels. Coastal fishing does have inherent dangers but these can be kept to a minimum with common sense but then equally ,once you have the bug and have had a couple of good fish then the rule book may well be left in the car as you hop ,skip and jump over slippery rocks as the tide starts flooding the rock pools. Or rush out to point of a sandbar without any consideration to the tide. Ending up on your arse. Expect to get wet with or without any rainfall! Slipping goes to the top of the list of hazards I have hit the deck countless times! I have definitely found out the hard way about suitable footwear. Initially I thought that felt and stud boots were the best choice and in some instances the studs will grip the rocks like glue, but in certain situations they are lethal and will offer no traction whatsoever. They tend to fail if you are clambering over large smooth surfaces, many of the locations that are productive for bass feature these large boulders. Try rubbery soles ,trainers seem to offer the best grip . Perhaps try taking a retractable wading staff for your wading and broken ground fishing . Some rock surfaces that are full of grip when dry can become lethal as soon as they get damp. Early morning dew can be a real problem and for that reason there are certain locations that I will only fish during dry conditions. So if a mist drifts in off the sea or it begins to rain consider your safety. Large areas of flats or expanses of broken ground can be a real danger to us once the tide begins to push.You need to study the tide table and get to know these locations slowly .Take small bites out of the apple rather than just dive into trouble. Maybe fish a new location in ebbing tides or neap tides ,don't rush in until you know how the water will flood into the channels and depressions . There is an item of safety equipment that you should consider getting and that is a gas inflated lifejacket. I have one ,it seldom gets used but its always there in case the sea conditions change. I chose a manual trigger version rather than an automatic due to the regular occurrence of waves soaking me. You will fish with added confidence if you wear one. I also pack small first aid kit and a VHF Radio in my rucksack when fishing with guests in remote locations. Don't overlook the sunglasses when large flies are whizzing around . I would definitely recommend breathable waders for our coastal fishing. You will often walk reasonable distances to find the fish and get away from the summer crowds ,that in itself epitomises the appeal of saltwater fly fishing for me. You need to look at the build quality particularly around the backside and knees these areas will take a beating as you clamber over rocks covered in tiny barnacles. I use Simms G3 they are Gore tex and hardwearing although the price tag will wear a hole in your pocket. During the summer I will fish much of the time with no waders on. I prefer to wear wet wade wearing fast drying lightweight trousers combined with cheap disposable trainers. I will happily wade up to knee deep this way. Normally by the time I get home the trousers have dried. A lightweight pack away jacket is an essential item. It may be a sunny day but waves can hit the rocks and drench you I can fish all day with wet legs and feet but a wet upper body is a different prospect. The jacket goes everywhere with me at all times. Sorry but yes I use the Simms Gore Tex lightweight jacket . I can find fault in just about every piece of equipment I have used but this jacket just stands out as one of my best investments to date. I now prefer to use a rucksack rather than a traditional fly fishing bag. If you need to climb up or down any rocks a bag will swing around to your front and get in the way or upset your balance . A rucksack however stays out of the way and balanced. 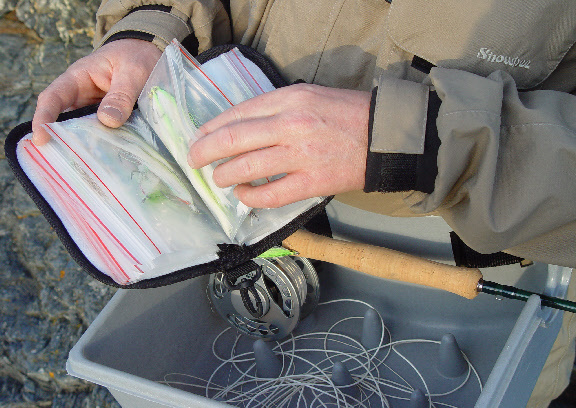 Zips are a major consideration with saltwater fishing , bags or clothes with metal zips or fasteners should be avoided due to corrosion. A line tray will help to preserve line and tackle. Every saltwater fly fisherman will probably have a love hate relationship with this piece of kit. They get in the way and look rather odd .But you need one .There are other systems around that will fold away or slide away but they don't seem to handle the demands of fishing coastal conditions as effectively as the hard tray. I have tried many of them and without a doubt the 'Orvis stripping basket' is the winner. it's the right size unlike my other ''hard tray'' and the webbing strap does not twist badly ,the rod holder is a great feature. Lets imagine you are standing on the beach, you land a big bass and want to take a photo. Where are you going to put your rod? You cant put the rod down on the sand. That could spell disaster. Sand and fly reels do not mix. The hard tray is multi talented, you will use the line tray all day regardless of stripping any line into it. Last but definitely not least on the check list has to be a head torch. You often want to be casting your fly as the dawn breaks. It is a critical time to fish. you need to be armed and ready. During early Summer the rods be rigged the night before and flies tied on ready to cast, I will often be finished and heading home by 8 AM. Hopefully with a big smile and a story to tell. The Nine foot eight weight is the workhorse. I would expect to do more fishing over the season with this rod than any other. It will cast a bulky fly or surface lure with relative ease. It should also still bend when you hook a fish. It has very few disadvantages .These days you are spoilt for choice. Look for a crisp medium or fast actioned rod with saltwater fittings. I also love fishing double handed rods ,they cast huge distances and enable you to control the line in the surf. 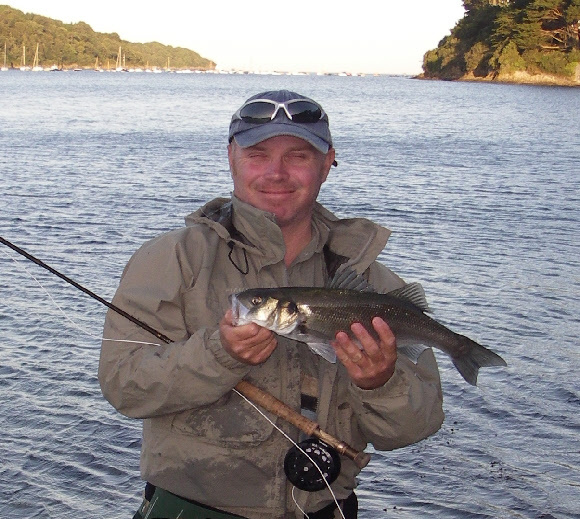 The lighter line models are fun to use when playing smaller UK saltwater fish. Look for the fast tapered rods as you need to maintain a tight loop when overhead casting in the surf. 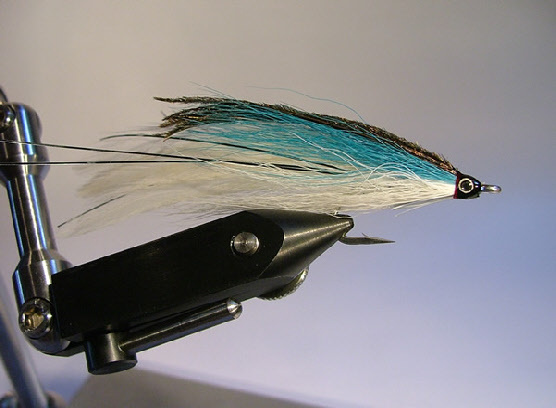 Some tidal rips run that fast that you can spey cast and fish 'Salmon Style' Swinging flies in a similar fashion. A well built corrosion resistant fly reel with plenty of backing is always preferable but the plastic variety are certainly corrosion resistant and will cope with fight from our U K species. I tend to fish surface lures or streamer patterns over shallow snaggy ground much of the time , these are best fished with a full floater. I would however recommend that you take and intermediate and a fast sinker along with you. The intermediate lines will also penetrate an onshore wind more effectively and the fast sinker will prove handy for finding those deeper laying fish. Intermediate Sink Tips are a great all round fly line. Not to forget leaders . Don't be afraid to go a little heavy. Leaders will take a beating in the sea. I would recommend eight to ten pound fluorocarbon for light estuary fishing and twelve to twenty pound fluorocarbon for fishing surf or amongst the rocks. Keep checking your leader as they can fray without ever snagging. I will happily fish a straight through leader with a perfection loop to loop connection. 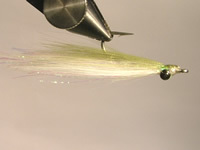 Where would we be without the humble Clouser Minnow ? This is without question the main contender. Size and colour may change but song remains the same ,as they say. Size 4 for small stuff and estuary work and size 1 for beaches and hopefully larger bass. 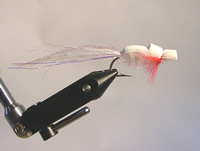 Throw a few size 1 Decievers into the wallet for good measure and never overlook the Gurgler. I have had great sport with this fly and not just for Bass. Pollack . Mackerel and Garfish also like to hit this fly as it plops and splashes away on the surface A Gurgler looks like a rather strange contraption but its definitely a fish catcher.